Wife and Mother, lover of God and people, writing and creativity! Valery has been in ministry in the church for over 28 years, alongside her husband Michael. Writing is a new and more recent passion that is growing in its focus and the priority in her life! Valery has been privileged to minister across Australia, as well as in the USA, Europe and in Asia. She is a sought after speaker for conferences and women’s ministry events. Whether speaking to a small group of women living in Urban poverty or to large church based groups, Valery is passionate about every person experiencing life transformation through Christ and the total freedom and wholeness that comes with a personal relationship with God. Valery’s other great passion is her family. Together with husband Michael they have 3 fabulous adult children Leah, Ryan and Elyse. It was a cold winter’s day and I was alone at home. What better to time to do some throwing out of old stuff and to consolidate my wardrobe? Now normally, when this motivation began to overtake me, I would take one look, feel daunted, turn on my heels and head for the kitchen for a cup of tea. But today was different. As I scrabbled on my knees, hands fishing for out-of-fashion, worn goods to give away, I reached expectantly into the cavern of mystery that is at the back of every woman’s wardrobe. And I discovered … hidden treasure! I couldn’t see it at all, due to the darkness in part, but also to the conglomeration of swinging dresses, coats and blouses that populated the hanging space, suspended from above like bored monkeys on a twisted jungle vine. Reaching through the overgrowth of too much clothing, my hands, searching for shoes, came to rest on an object that felt interesting and familiar, but very un-shoe like. This dear and precious item, about which I had written an entire chapter in my book “Dancing With My Daddy”, had been lurking in the dark awaiting discovery on just such a day as this. The tapestry had been buried at the back of the quiet and undisturbed space, disguised and protected as it sat inside an old pillowcase. As safe as houses it had been, due to my rare forays into the depths of this part of the robe jungle. For rarely did my fleeting motivation ever lead to any results of the significant culling of clothes! The impact of my discovery was instant as I recognized it at first feel. Like a trophy deservedly won, I whisked it triumphantly into the light, handling it with the care and concern that one gently does with an aging prized possession…for indeed it was! Again it told its story to me. Sitting back on the carpet, I gently caressed my treasure’s surface and broke into a smile at the memory of its discovery, years before, and the impact of the chapter that had come out of that day. It’s a very old, unfinished, neatly sewn embroidered piece of cloth that my Dad had crafted way back in the days of his soldiering life with the army. As a member of the British Colonial force once stationed in the ancient city of Kolkata, India, (Calcutta, it was once called) Dad had been impressed and moved by the appearance of the beautiful monument, the Taj Mahal. 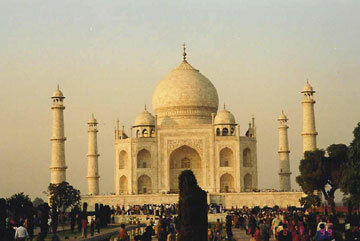 Its building was not only impressive but in many ways magical and spiritual all at once. Years later as he tried to recreate its image in sewn threads, ever so neatly brought together with what remained in his mind, he would never have thought that one day, almost seventy years later, it would be written about in a book by his daughter. My Dad never finished the tapestry. And therein lies the principle impact of this artwork, and of its story. It’s unfinished, but significant. My father struggled with insecurity and feelings of insignificance for most of his life…just as I do…just as many of us would admit to as well, in our quiet moments. We are like the tapestry… unfinished, but so very valuable. It’s unfinished, but a treasure in the eyes of those who behold it with love. Have you ever been concerned that you are “unfinished’? Felt insignificant? Have you worried that you are not achieving the things that are ‘important’ and ‘acceptable’ to everyone around you, most of whom seem to be so much more effective in life? Like a forgotten, half finished creative work, are you content or resigned to be sitting in the shadows, disappointed with yourself and your achievements and where you are in life…even some of the time? I don’t know anyone that’s truly happy with the way that they are, how they behave (mostly), or what they’ve been or even where they’re going in life, do you? Most of us feel ‘unfinished’ sometimes, and wonder if that elusive capture of what we think we really want to be, to do, or to have…will ever actually be ours! If we were satisfied with ourselves the way we are, wouldn’t we lose our ‘edge’ and our striving to be different? Wouldn’t we just sit around and gloat over what we’ve done and achieved, never to cultivate a vision and a healthy dissatisfaction with what’s ahead? Unlike our human tendency to leave things ‘undone’ we can depend on God to bring things to a completion…and a perfect one at that – because He’s God! So unlike ourselves in our pursuit of perfection, God leads us and gently guides us towards His path for us…highlighting along the way all the things that help us to ‘grow’ and to become even more like the beautiful picture that He’s created us to be, than we can imagine. I’m glad I started to tidy up my wardrobe on that winter’s day. I was reminded of a beautiful lesson. I may feel insignificant at times, but to the One who made me…I’m a beautiful and timeless treasure. This week in Orlando, Florida, a very special conference is being held by my publishers….Influence Resources. I am SO sad to have to miss this! Originally it was intended that I’d be signing my books there and meeting many people who have also published books with this amazing company. I could have learned so much, made so many new friends and had new experiences. Indeed, I find myself at times wistfully daydreaming about the Florida sunshine as I contemplate what a great gathering they are having there…without me! Being winter here in Sydney definitely doesn’t help matters! But I’m needed here right now. Sometimes life just doesn’t go the way I planned it. And it’s disappointing. “The feeling of sadness or displeasure caused by the nonfulfillment of one’s hopes or expectations”...that’s how my dictionary describes what’s going on right now for me. When I expect one thing, and it turns out that it doesn’t happen quite that way. Often, dealing with disappointment can leave us depleted in many ways…our energy levels drop and our hearts dwell on the negative rather than the positive things of life. We can become withdrawn and treat others differently, often as though it’s their fault! In the chapter of my book, Dancing With My Daddy, called The Team, I tell the story of a 10 year old immigrant girl and her disappointment. A day when things definitely didn’t go as she wanted them too. “How do you overcome disappointment when an earthly father lets you down? Well, many of us learn that lesson early, and this story is just one of the many that could illustrate the point. You might say, “But every one lets their kids down. Just get over it!” And of course, you would be right. But when we ‘just get over it’ we tend to bury the hurt along with the incident. And many people have incidents of ‘let down’ that are so much greater than this one, but the hurt always goes down deep, with its descent gathering to itself every other time that we have been let down. The package lands with a resounding thump at the bottom of our hearts, that heavy combination of weary hurt affirming our lack of esteem on the inside. And there it sits, sinker-like, as in the depths of an ocean of broken dreams, waiting for the Discoverer to dig it out of the deep hiding place, exposing it to the Light that heals. The miracle is, of course, that Jesus can heal our disappointments. I am believing for the complete healing of someone very close to me at present. And whether we can acknowledge that our simple disappointments in the every day are just as important to surrender to the Healer as these massive needs that life brings to us at times, we must remember that all of us face them, on whatever scale, every day. Disappointments – they can even cause us to think of ‘giving up’. But giving up cannot be on our list of options. And now….excuse me as I spend some time choosing my ‘better option’. For me it’s time to listen to some uplifting music, thank God for His intervention in my life, and think on the future. Where can I find “Dancing with my Daddy”? Things have been a bit quiet on the blog front. Life happens! Author adminPosted on August 3, 2013 August 27, 2013 Leave a comment on Where can I find “Dancing with my Daddy”? Excerpt from Introduction to Dancing With My Daddy. The vital role played by the relationship between father and daughter is often hindered by life’s hurts and difficulties. The protection, nurture and covering originally intended often goes awry, and daughters, because of this, find themselves measuring God with the measure shaped by their earthly dad. And so we as daughters are often left with a feeling of being incomplete. A feeling of having no role model of fatherhood that we are content with. We may feel the need to reach out and make our fathers someone that they never were, are now or ever could be. For the daughter who has suffered abuse at the hand of a father, who has been left with shattered dreams and hopes because of the under-valuing of herself in the eyes of perhaps the most important person in her life, a relationship with the Heavenly Father can release her untapped potential, helping her to flourish in a beautiful and releasing way. Only He has the ability to wipe away the hurt, the negative images and the damage that may have been impressed upon her. Is this Christmas struggle real?